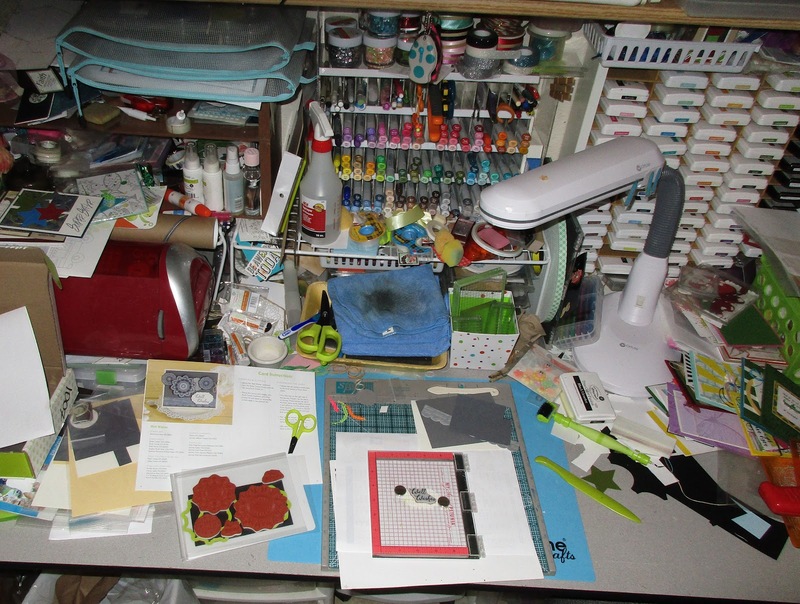 We've had so much happening the past couple weeks that my desk has been neglected! We got beautiful light reddish brown concrete poured under our front awning and at the back door for the car. We'll be getting an awning put over the one in back next week. But all this took time and work and we still have a bunch to do. I'll share the finished work in a couple weeks or so. But you do get the opportunity to see my desk from last night and this is part of a blog tour put together by lovely Julia at the Stamping Ground. This is my card rack at the store where I rent a room to teach once a month. I started with a little desk top rack but the store owner wanted more cards so another at the store gave me this rack. I had to restock last Thursday as they sold 16 cards!! I'll be checking inventory when I teach my next class on the 26th. As of restocking I had about 75 cards on the rack. So now that you've reached the end of my post please head over to the Stamping Ground and check out desks from all over Europe and the U.S.
Wow, that rack is a lovely way to sell cards - they take a bit of a battering from browsers don't they! Love the stamp set..nothing sells better than a well put together sample card! Congrats on those card sales! Nice rack, too. Hi Carol. Don't the cards all look great in that rack? Well done you! Glad they are selling well.